The world’s first operational fighter, the German Me 262, brought an end to propeller-driven combat aviation for most air force planners. From here on out the future would be jets. In 1945 the US Navy issued a requirement that the next generation of carrier-borne fighters would be capable of speeds of 600 mph. Chance-Vought won the contract competition with a revolutionary new design. 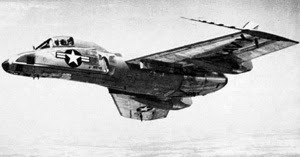 The F7U would be a tailless aircraft with twin jet engines in its fuselage that would feature afterburners to give it additional bursts of power. After a long period of development, this aircraft would eventually equip 13 Navy and Marine squadrons. 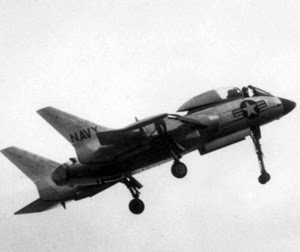 Yet three years after reaching the fleet in 1954, the F7U-3 Cutlass was withdrawn from service. The aircraft was an ambitious design. It had gone beyond cutting-edge and strayed into bleeding-edge technology. The initial Westinghouse engines were disappointing, leaving the aircraft underpowered. Its radical design enabled it to achieve a tight turning radius but, overall, it was difficult to fly. The F7U was overly complicated a challenge to maintain. Engineers eventually added more than 100 doors and access panels to its design. The twin engines took up most of the available room in the fuselage, leaving little to spare for fuel. 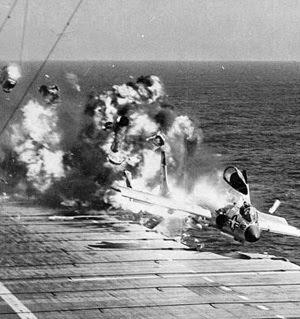 This resulted in a carrier plane with insufficient range for ship-board operations. This also meant that fuel-guzzling afterburners were of little use. 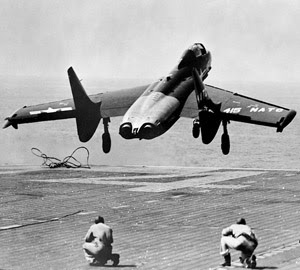 The tricycle landing gear, featuring a drastically extended nosewheel, contributed to the danger in carrier landings. The nose of the aircraft was redesigned repeatedly to improve pilot visibility but the problem remained unsolved. 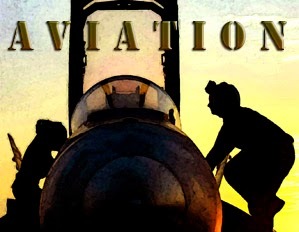 A 25% accident rate added considerably to pilots’ unhappiness with the Navy jet. 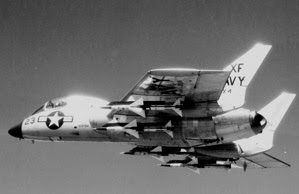 Once the safer, more reliable and powerful F-8 Crusader became available to the fleet, the F7U was gratefully withdrawn. The aircraft was not a success but its experience aided the research in developing future jets for the Navy, such as the F-14 Tomcat. The blood pounded in his ears. The siren grew close, paused at its peak and then fell away. He slipped a quick look around the building’s corner. Nothing. Good. He gathered in the details of his surroundings. Cars parked in a line on the left and up the hill of the one-way street. A stairway climbed into darkness, following a brick wall bathed by a street lamp and then cut sharply into empty night. A single window burned with light above the store closed for business. A child’s ball rested forgotten and lost among the urban sediment of the gutter. Blood ran along his left hand and stained the edge of his sleeve. This is not a time to run. You must slip away in a manner that will not bring notice. Take the stairway. Walk as though you were carrying a six-pack home after work. Whatever you do, don’t look back. Feel safe, casual. Nothing to see here, folks. Move quickly only in the gloom. Get far away from here. There will be other patrols soon. What to do about the hand? It can be cleaned easy enough but then there’s the shirt. 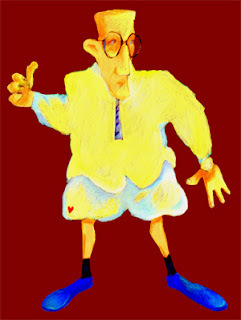 You’re bound to be stopped, nabbed by a cop’s spotlight prying the dark. Patrol cars are probably boxing you in right now. Find a place to hide. An open window, an unlocked door, something unattended would be perfect. Not a chance. You’re not that lucky. You’re cornered. You’re screwed. Shut up! Don’t panic. Keep moving. Stay in the dark. Maybe find a spigot - anything to wipe your hand clean. Look in a dumpster. And loose the shirt. You can’t. No one’s walking about in a T-shirt with this weather. You’ll be noticed. So roll up the sleeves part way. It conceals the blood but it stains more of the sleeve. So what? Take a chance. Keep walking. There’s nowhere to hide. No siren warns you next time. They’ll just roll up, see you and you’re dead. You’re out of time. They've got to be close by now. What are you doing? Run! Run as hard as you can. I am a body. I am many voices talking. I am pavement. I am cold. I am wet. I am pain, far away… somewhere. Leave me alone. Stop. No. Don’t let it happen. Stop it. 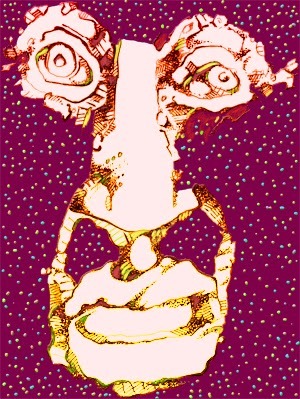 I’m my head. Me now. Me. 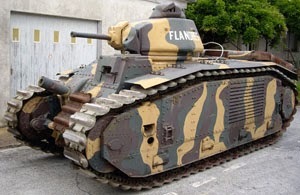 Once the decision was made to no longer accept the tank limitations placed on Germany by the Treaty of Versailles armored production moved forward at a rapid pace. Still, the time needed to develop Germany’s main battle tanks, the Panzer III and Panzer IV, was too long a wait and the military turned to interim solutions. The first of these was the 2-man Panzer I, armed only with machine guns. 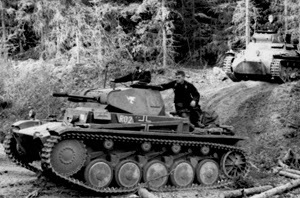 A short time later, in 1935, production began on the 3-man, more heavily armed, Panzer II. 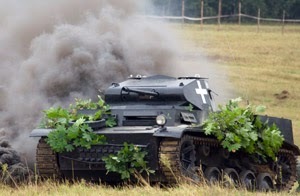 Both Panzer models were primarily intended for training purposes but the advent of war in 1939 forced the German army to rely on them in a significant combat role. 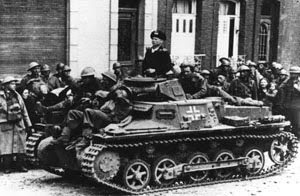 The Panzer II formed the backbone of Germany’s armored divisions in both the invasions of Poland and France. 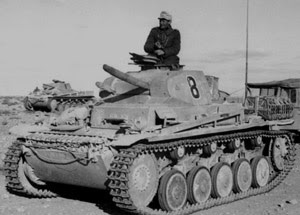 They also had an important role with Erwin Rommel’s Afrika Korps in the desert warfare of 1941. 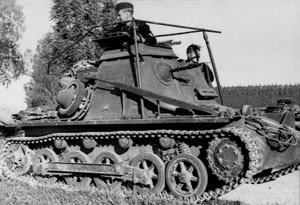 Limitations in its design made it unsuitable for use in Operation Barbarossa, the invasion of the Soviet Union, except as a reconnaissance vehicle. The PzKpfw II was best suited for an infantry support role as its 20mm cannon was unable to penetrate the armor of other tanks. At the same time, its own light armor was vulnerable to anti-tank weapons of most any kind. The rate of fire of the cannon was reasonable but vision from within the turret was poor and fire control could be difficult. The maneuverability and agility of the Panzer II was good but this performance was limited by the engine’s power. Its high-frequency radio enabled coordination between tanks in combat – an important factor in winning the battlefield. The Panzer II did surprisingly well in its initial engagements in Poland and France because of its mobility. 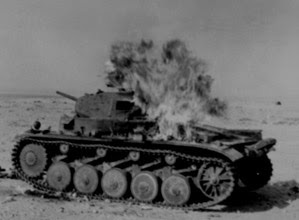 Blitzkrieg tactics emphasize speed and the Panzer II was competitive in this regard with most any tank available at the time. 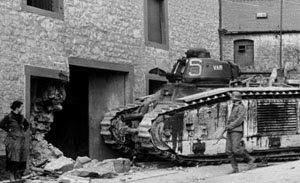 Still, its size and limitations in armor and armament made it unable to survive the battlefield beyond 1941. By then, though, the Panzer III and Panzer IV were now doing the heavy lifting and the Panzer II had already delivered more value than anyone would have been expected when it was introduced. A sharp crack kicks about the wood burning within the stove that helps keep the cabin warm and the roof free from snow that accumulates nearly everywhere else. An old metal pot sits hot atop the iron stove, filling the air with the strong scent of fresh coffee. The home is made sturdy with logs and has a rock chimney along its side and a modest porch in front from which its inhabitants can sit and watch the wildlife that come to drink from the stream that cuts across the surrounding alpine meadow. Behind the home and extending around to its sunlit side steeply rise majestic mountains white with snow-covered pine until the timberline is reached and then, a sheer expanse of rock face stretching to nearly in reach of the clouds plowing the nautical sky. A nearby young spruce is draped with lights. It’s the season of holidays, of long nights and people drawing close. The familiar sound of the pickup truck making its way up the gravel road draws her to the window. Two deer only briefly raise their heads at the sound of the horn before returning to feeding on tall grass. The truck pulls up in front of the porch and she sees what must be two months of provisions organized in the bed of the truck. Among the sacks of flour, rice, dried beans, tins of coffee and boxes laden with assorted spices and seasons is a role of canvas and tied-together-wood for the later making of stretcher boards. It’s all quick work for the experienced. There’s great kitchen bins with metal latches to discourage a wayward raccoon or pushy bear. Visitors of this sort almost never make it inside but there’s no good reason to tempt them. Whatever shooting there may be will be for reasons other than clearing nosey animals from the home. The bins rest filled with winter stores. The growing glow from the fireplace throws shadows dancing about the room. A kerosene lamp is lit. The two sit at the old rustic table, grateful for the warmth and the surge they feel from the bitter black coffee. California seems like many years ago. 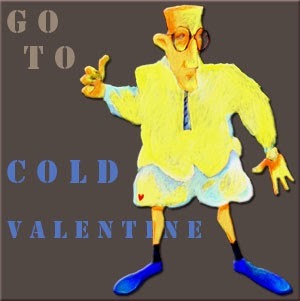 He smiles and reaches into the deep pocket of his coat. He pulls from it a small box, held neatly closed by colored string, and pushes it across the table to her. She pulls open the string and lifts the lid. Arranged inside is a necklace, carefully handcrafted from the charming artifacts found about the forest and glades of their mountain home. I’ve talked with Elmer Fudd on more than one occasion. I can tell you I know something about what makes him tick. How would I know? Because I see a good deal of me in Elmer Fudd. I want to find the hat that I can wear and people will see it and they will know I’m the real deal. I’m on a serious mission. So far, though, all the hats I wear don’t seem to fit me right. They just kind of slump down over the top of my ears so it looks like I’m having to grow some more so I can fit into what it is I’m wanting to be. You know how frustrating that is? My closet is filled with clothes from all kinds of stores. Look at me. See? I’m an adventurer today. I’m a rugged man’s man, climbing rocks in the outback in search of grizzly. Maybe tomorrow I will step outside in a fine three-piece, pinstripe suit and be a captain of industry on an evening stroll about the neighborhood. Possibly. On the other hand I’m beginning to feel like deck shoes without socks, white slacks and a Hawaiian shirt with Bird of Paradise over a field of black. I’m stunningly casual, right? Anyway, that’s what the sales clerk told me. 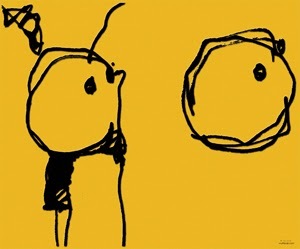 Ever notice how some people can fix their eyes on yours and take your hand and walk you into whatever dream they want you to believe and you go along because they are so sincere and so smart and just incredibly confident and satisfied with who it is they are. I’m amazed there really are people like this. How do they do it? Ask me to do the same thing and I wind up looking at your shirt and flubbing my lines. I don’t make any sense. I find a reason to excuse myself and go sit alone in a corner filling up on cookies. It’s not fair. I really, really need to be someone I’m not. It ain’t going to happen for me. I know it. What a crummy deal. I’m headed to the mall. Maybe there’s something I can wear that lets me feel the way I want myself to be. I’m thinking possibly expensive jeans with a western belt, a double-pocket shirt with metal buttons and pointed-toed boots. I’m Hud. I won’t have to talk to be the part. I’ll just walk around with a knowing, cynical look. Actually, it doesn’t really matter how I show my face. People take one look at me and they know. I can’t shake it. I’m Elmer Fudd. Be vehwee quiet. I’m hunting for wabbit. 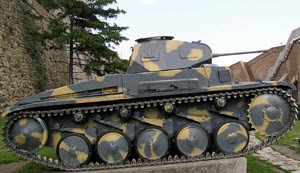 The PzKpfw I was Germany’s first mass produced tank. 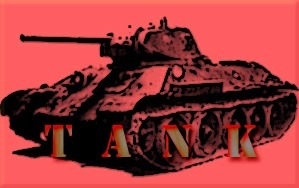 When introduced in 1935 it was already inferior in firepower and armor to tanks being made in France, Britain and the Soviet Union. It was always considered by its developers as little more than an interim solution – the initial basis for developing an armored force following Nazi Germany’s renunciation of restrictions applied to that country by the Versailles Treaty. The German General Staff were determined to quickly get a vehicle in the hands of their panzer troops so they could begin training. In time Germany would produce more powerful, better performing tanks to supply their growing panzer divisions. 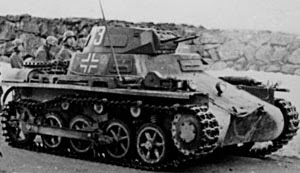 122 Panzer 1s were provided the Nationalist forces of General Francisco Franco in the Spanish Civil War during the mid-1930s. Its survival was primarily due to the lack of anti-tank guns available at the time. Once these weapons came into wide-spread use the Panzer I was doomed because of its thin armor. Its role was limited to suppressing enemy infantry because its dual turret-mounted machine guns were virtually ineffective against opposing armor. Germany’s military leaders would by 1941 replace the PzKpfw I on the front line with the PzKpfw II, a light tank that carried a 20mm cannon. It also was inadequate for opposing the enemy’s heavy tanks. By the time of the Battle of France in 1940 the Panzer Divisions also began to incorporate more powerful Panzer IIIs and Panzer IVs into their ranks. Ultimately, German battlefield successes were attributable to a doctrine of combined arms; the mobility and concentrated firepower of grouped tank formations along with close support from air artillery - the tactical use of Luftwaffe dive-bombers to eliminate enemy strongpoints. This was all made possible because of Heinz Guderian’s exploitation of portable radio communications to keep the various units responding to a single command in real time. Even so, the spectacular success of Blitzkrieg tactics in 1940 against equivalent Allied ground forces was in great part due to Germany’s dominance of the air. Luftwaffe air superiority at critical points made Guderian’s combined arms tactics possible. The Char B1-bis was a superior heavy tank for its day. It could survive a hit from the armament of most any German tank or anti-tank gun, except for the deadly German 88. Adding to its toughness were self-sealing fuel tanks and a welded hull as opposed to one held together with rivets. Rivets dislodged by a shell strike had a way of becoming projectiles that ricocheted about the inside of the tank. The Char B1-bis was surprisingly maneuverable. The driver used a conventional steering wheel to guide it. It might have been an effective offensive weapon, used to exploit a breakthrough of an enemy’s front line except the French leadership still saw the battlefield as being a clash of infantry formations and tanks were dispersed among the foot soldiers to be used in a supporting role. The punch produced by a tight fleet of Char B1s firing their 75mm guns was nullified by obsolete tactics. 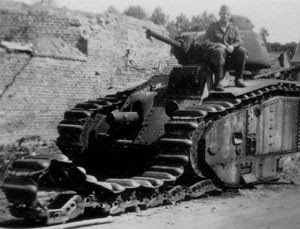 The Char B1-bis was expensive to build and operate. Maintenance was difficult. Its bulky height made it an inviting target. Its weight also made it slow. The single-man turret was cramped and the commander had the responsibility of loading, aiming and firing its 47mm gun as well as being aware of the battlefield situation and leading his crew. The hull-mounted 75mm gun was not traversable requiring the driver to line up his tank with the target before firing. With no radio communications between tanks the effectiveness of working together in unit formation was greatly diminished. 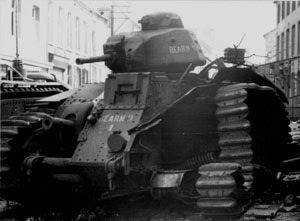 The Char B1-bis would have been a successful tank design for the First World War but the tactics of armored warfare in combination with close air support had progressed significantly during the two decades separating Versailles with the cataclysm of May 1940. France hadn't prepared itself for warfare in the 20th century because its people hadn't yet recovered from the sacrifices made during the last war. The German leaders exploited their neighbor’s reluctance to fight by first isolating them from the other nations on the continent and then plotting their ultimate destruction through the application of rapid military force – the highly mobile mechanized warfare that came to be called blitzkrieg.